Eastleigh Mayor, Cllr Maureen Sollitt and her Deputy Cllr Chris Thomas, have both quit the ruling Liberal Democrat group on Eastleigh Borough Council over concerns around the emerging Local Plan. Their move means that Eastleigh’s Liberal Democrat Group no longer have any borough councillors in Eastleigh North. Following Cllr Mark Balaam’s resignation from the administration last month, the Independent Liberal Democrat group now have five members and now hold a majority on the Eastleigh Local Area Committee. Like his ward colleague, Cllr Thomas has many concerns about the direction of the Local Plan and its impact. “The height of the railway bridge at Allbrook is a serious obstacle in this plan. It is shocking that the traffic survey for the proposed link road will not be complete in time for Monday’s Full Council vote.” The Mayor and Deputy Mayor, like their colleagues in the Independent Group, remain members of the Liberal Democrats and support the aims and principles of the party nationally but do not share the local Liberal Democrat views on options B and C in the Local Plan. Both councillors remain in their roles as Mayor and Deputy Mayor but will now represent their constituents as Independent councillors. 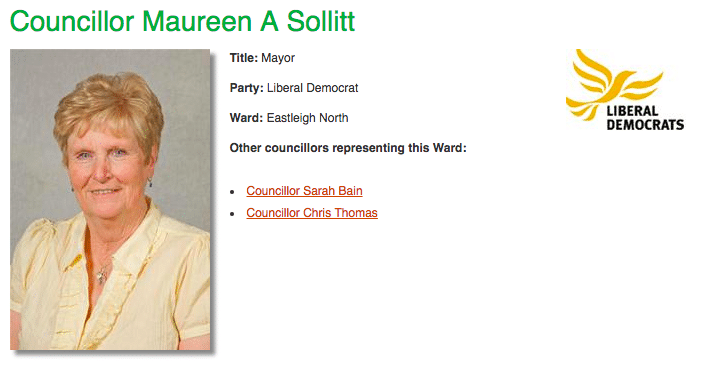 Note to Editor: Cllr Maureen Sollitt, first elected in 1996, has served as Mayor of Eastleigh twice and represents Eastleigh North. Cllr Chris Thomas, first elected in 2002, currently represents Eastleigh North.